An investigation into the disappearance of 43 students from the teachers college known as Ayotzinapa in the Mexican state of Guerrero. May 4 2015, 12:01 p.m. The government said it had found the “historical truth” behind a night of terrible violence in Iguala. But evidence suggests the state isn’t disclosing all it knows. FOUR BUSES PULL UP to the base of the Mexican Army’s 27th Infantry Battalion. It is January 12, a bright, clear afternoon in the southern state of Guerrero, nearly four months since 43 college students disappeared, most in the backs of municipal police vehicles, during a night of shooting and murder in the city of Iguala. The majority of the students were seized at an intersection less than 2 miles from the army base. Hundreds of their family members and classmates, from a teacher-training college known as Ayotzinapa, have come to protest. They want answers. Not only that, they want inside. A truck plows into the front gate of the base. Parents pull at the barbed wire surrounding the installation, and young people with their faces wrapped in T-shirts and bandanas stream inside. Hundreds of soldiers and police are waiting. Stones fly through the air. Volleys of glass bottles rain down. Tear gas fills the area, and a military helicopter circles above. The parents repeat a chant that has become their rallying cry. They were taken alive, we want them alive. Outside the basketball court at Ayotzinapa that serves as a nerve center for the families of the missing students. FROM THE MOMENT the students disappeared, their parents have demanded their return. Though it seems unlikely they are alive, their parents have drawn attention to inconsistencies in the official account of what happened, highlighting the government’s reluctance to tell the public everything it knows. The Intercept has conducted a six-month investigation into the government’s case, based on a review of a portion of sealed files prepared by the office of Mexico’s attorney general — Procuraduría General de la República, or PGR — which includes statements by police officers and gang members allegedly involved in the events that night. The Intercept has also examined communications records from security forces in the area, conducted dozens of interviews, including with students who survived the night’s violence, and analyzed months of reporting by Mexican investigative journalists. Far from an isolated incident, the disappearance of 43 young men in one evening of violence was unique mainly in the attention it received. The investigation has revealed the federal government’s concerted effort to place blame squarely on municipal actors, despite ample evidence of a broader circle of responsibility. Senior officials in Mexico City have presented a narrowly tailored scenario of a mass kidnapping committed by local officials ending in murder carried out by gangsters in the Iguala area. But evidence buried in the state’s own files points to a case of enforced disappearance, which, unlike kidnapping, includes the involvement — either active or passive — of state actors, and can constitute a crime against humanity under international law. Throughout the case, the Mexican government has leaned heavily on the statements of detained suspects rather than physical evidence. The approach has drawn skepticism in a country with a well-documented history of authorities using coercion or torture to extract false confessions. Statements in the federal file suggest the government has presented a skewed selection of evidence in its account of what happened — information that supports its narrative has been publicly presented, while details that contradict the official version have been downplayed. The Intercept provided an extensive list of questions to the PGR and the Mexican Embassy in Washington, D.C. Despite repeated requests, neither the PGR nor the Embassy provided answers on the record to any of the questions, or made officials available to respond on the record. Though there is still little clarity on the question of why the students were disappeared, or where they were taken, statements in the federal investigation map out a criminal takeover of the region, exposing the corruption that has swallowed many of Guerrero’s governing structures. Coordinates provided by one detained gang member, for example, led authorities to a fetid swamp in an area called La Laguna, where the rotting corpse of a former Iguala police chief was recovered. The suspect also described a ranch known as Los Naranjos — The Oranges — a patch of property where gangsters dumped bodies. Another burial site, described by two suspects, stood out early in the case. There, the men said, they had buried some of the students from Ayotzinapa. When investigators examined the site they indeed found bodies — 28 of them in mass graves — but none were the students. Relatives of the 43 disappeared students leave a meeting with Attorney General Jesús Murillo Karam in Chilpancingo on Nov. 11, 2014. IN EARLY NOVEMBER, a meeting was held in an airport hangar in Guerrero’s capital, Chilpancingo. Mexico’s attorney general, Jesús Murillo Karam, came by helicopter; the parents of the 43 came by bus. The cavernous space was filled with sunlight. The attorney general would offer a gruesome narrative: The young men, after being detained by municipal police on September 26 in Iguala, had been handed off to a murderous gang, slaughtered, set on fire, reduced to ash, and dumped in a river. According to the government’s account, which took shape in a series of press conferences, Iguala’s mayor gave the order to “contain” the students. His wife was delivering an address in a public plaza, and the mayor was concerned that the students — known for disruptive protests — would sabotage the night’s event. The government claimed the students initiated the violence by throwing rocks at municipal police officers, who responded with deadly force. Police from Iguala, along with police from the neighboring town of Cocula, seized and transferred around 40 students to an area known as Loma de Coyote. Federal investigators said the students were then handed off to members of a criminal gang known as Guerreros Unidos. Most of the students were allegedly laid on top of one another in the back of a truck with a metal cage bolted to its bed, while a handful of others were packed into the back of a smaller pickup. The trucks set out in the dark for a seldom-used trash pit at the end of a bumpy road 4 miles outside of Cocula. The young men on the top of the pile were reportedly still alive by the time they arrived, but more than a dozen others had suffocated under the weight of their classmates. In a January address, the attorney general played video clips of statements made by detained members of Guerreros Unidos. He also showed a video — complete with animation and a mournful electronic score — in which one of the suspects reenacted the students’ final moments. The man demonstrated how dead students were dragged from the vehicles and tossed like sacks of grain into the dirt. The survivors were lined up, interrogated, and accused of collaborating with a rival gang, Los Rojos. Then, kneeling in the dirt, the young men from Ayotzinapa were shot to death, one by one, according to the detained suspects. The garbage dump near Cocula where the bodies of the 43 students were allegedly burned. THE GOVERNMENT’S UNEQUIVOCAL explanation generated widespread skepticism, not just from the loved ones of the disappeared and protestors on the street — but also from scientists and forensics experts who disputed the viability of the burn scenario, as well as journalists looking into details the attorney general’s office seemed eager to keep under wraps. In December, scientists from the Universidad Nacional Autónoma de Mexico and the Universidad Autónoma Metropolitana published a report questioning the fire described by the detained gangsters, challenging the PGR’s key claim that the Cocula dump had been converted into an impromptu crematorium. According to the report, incinerating 43 bodies using wood would have required 33 tons of logs 4 inches in diameter — taking up a space 10 times the size of the trash pit. Modern crematoriums, the scientists added, use roughly 115 pounds of gasoline per body. Had car tires been the primary fuel source, nearly 1,000 tires would have been needed, depositing 2.5 tons of steel wire and producing a pillar of smoke visible from surrounding towns. If the government’s timeline is to be believed, these materials would have been assembled and transported to the scene in a matter of hours. According to a flight record included in the state of Guerrero’s investigation, at 11 a.m. on the morning of September 27, a helicopter took off toward Iguala in search of the students, dispatched from the state capital to the south. The Cocula dump is located about 10 miles southwest of Iguala, and around midday, the helicopter circled the city and surrounding areas. According to the suspects’ accounts, the fire burned until about 3 p.m. — but the state’s report made no mention of a blaze or smoke recorded by the helicopter’s crew. In the river near the dump, the government claimed to have recovered a trash bag that contained human remains, including bone fragments. Seventeen forensic samples from the bag and the dumpsite were sent to experts at a laboratory in Innsbruck, Austria. In December, Murillo Karam announced that the Austrian experts had positively identified a fragment from the river as belonging to one of the disappeared students — 21-year-old Alexander Mora Venancio. The experts deemed it highly unlikely that the remaining samples, severely degraded by high temperatures, would yield positive matches. Nevertheless, in January, the Mexican government expressed its “legal certainty” that Mora Venancio’s 42 missing classmates shared his supposed fate — slaughtered and incinerated at the Cocula dump, then tossed in a river. Not trusting the government’s experts, the parents of the missing students had enlisted the help of the Argentine Forensic Anthropology Team, or EAAF, which has investigated atrocities in more than 30 countries over three decades. In December, the Argentine team confirmed the identification of Mora Venancio’s remains, but emphasized that because its members did not witness the retrieval of the trash bag from the river, they could not confirm the government’s claim that his remains had been found in the river and burned at the dump. A photograph of forensic evidence projected onto a screen during a government press conference. The EAAF had good reason to be concerned about the government’s forensic capabilities. To test the remains collected from the dump and the river, federal investigators and the Argentine team each assembled more than 130 genetic profiles of family members related to the disappeared students. But, as the PGR would later admit, federal experts had misidentified 20 of the profiles they had submitted. The government’s account rested in part on the assumption that there had been just a single fire at the dump — the one that burned the students’ remains. But according to the EAAF, satellite images revealed evidence of multiple fires at the trash pit dating back at least four years. The EAAF team pointed out the discovery of a jawbone with dentures — according to interviews with parents, none of the disappeared students wore dentures. The government appeared to move with haste to put the case to rest. For instance, the area of investigation at the dump was divided into a grid of 137 sections. In February, after Murillo Karam declared “legal certainty” about the students’ fate, the government’s investigators had fully analyzed only 30 sections, according to the EAAF. The Argentine team suggested that the government had looked only for evidence that fit its scenario. “Physical evidence should be interpreted in all its possibilities, without giving preference to those interpretations that only include a possible match with the testimony of the accused,” the EAAF’s report stated. Alternative theories emerged to explain how and where the bodies were disposed of. Among the most provocative, widely cited in the media: the bodies were destroyed in a trash incinerator or crematorium at an army base. No physical evidence has been found that supports this theory; it has been kept alive by the government’s failure to fully address it. Government agencies have failed to provide clear answers to public records requests from the media about the location of crematoriums and incinerators on army bases in the region. Protestors confront police in front of the 27th Infantry Battalion base in Iguala on Jan. 12, 2015. FORTY YEARS AGO, Guerrero was the front line of Mexico’s Dirty War, waged by the military against left-wing guerrilla fighters, many of them graduates of schools like Ayotzinapa. Torture and extra-judicial killings — including dropping prisoners from airplanes — were committed with impunity. With memories of state-sponsored violence embedded in Guerrero’s memory, it was little surprise that attention turned to the 27th Infantry Battalion, and that, on January 12, protesters converged on the base. Nonetheless, the government stood firm. The military, though not a direct participant in the attacks, was aware of some of what was happening and did not intervene to stop them. His statement was true to only a limited extent. A selection of military records, released to a handful of Mexican journalists in February and March under a federal transparency law, indicated that troops stationed in Iguala were aware of the students’ movements prior to their arrival in Iguala — well before the first shots were fired. The records also showed that the military communicated directly with the municipal police force that attacked and detained the students. Examined in detail by investigative journalist Marcela Turati of Proceso and reviewed by The Intercept, the records indicated that the military, though not a direct participant in the attacks, was aware of some of what was happening and did not intervene. Among the records was a report titled “Arrival of the Normalistas,” dated September 26, which detailed a series of incidents throughout the evening. The report contradicted a claim attributed in the media to Col. José Rodríguez Pérez, commander of the 27th Battalion, who reportedly said his soldiers “found out last” about what was happening. In fact, the two-page “Arrival of the Normalistas” report was signed by Col. Rodríguez Pérez. The document noted the students’ presence on a highway outside Iguala at 7:40 p.m., their attempts to commandeer buses at a toll booth between 8 p.m. and 8:50 p.m., and their arrival at the Iguala bus station at 9:20 p.m. The students were followed by municipal police as their buses inched through Iguala’s congested streets, and when the buses were stopped at an intersection, the students got off and “assaulted police officers with stones, so that the latter responded to the aggression, detonating firearms,” the document stated. One of the few soldiers named in the military documents reviewed by The Intercept was 2nd Capt. José Martinez Crespo, who spent the night on patrol and was present at a private medical clinic where wounded students were seeking treatment. The soldiers took photographs inside the clinic, and one of the photos shows a student bleeding from the face as a classmate comforted him. According to the military records, the students “thanked 2nd Capt. José Martinez Crespo for the support provided” and said they would be on their way, seeking medical care elsewhere. Omar Garcia, one of the students at the clinic that night, remembered the encounter differently. The young men did not receive medical care once the soldiers arrived. A video of the capture of José Luis Abarca and María de los Ángeles Pineda Villa. ON NOVEMBER 4, a video surfaced that showed an elite unit of federal police descending on a seemingly abandoned house in a run-down, densely populated neighborhood in Mexico City shortly before sunrise. The government would trumpet the arrest of the couple inside as a victory in the case. Iguala’s mayor at the time of the disappearances, José Luis Abarca, and his wife, María de Los Ángeles Pineda Villa, were the perfect villains. Abarca had been investigated for illegal enrichment and locally suspected of murder. His wife, meanwhile, hailed from a family of drug traffickers, and had once publicly threatened a reporter who crossed her, warning she would have his ears cut off. Nevertheless, it’s far from clear the couple played the central role in the disappearances that the government has contended. In November, the government claimed that Abarca gave the order to “contain” the students after they entered Iguala, supposedly issuing the order over a police radio using a code name, A5. The order was reportedly heard by David Hernández Cruz, whom the government identified as a police radio operator. Hernández Cruz’s alleged role figured prominently in press conferences highlighting advances in the case. The portrayal of Abarca as a criminal mastermind was largely based on what comes across in the federal files as a game of telephone: Hernández Cruz said he overheard a senior Iguala police officer saying on the radio that an order to detain the students was issued by someone with a code name, A5, that was associated with the mayor. The government’s theory also relied on Hernández Cruz occupying a position that he may not have had: According to Proceso reporters Anabel Hernández and Steve Fisher, there is no record of a dispatcher named David Hernández Cruz at the Iguala police department. In February, the magazine reported that Hernández Cruz had been abused in custody, then released after providing his crucial account. In presenting Abarca and his wife as “intellectual authors” behind the students’ disappearance, Murillo Karam leaned on information submitted by another questionable witness: Sidronio Casarrubias Salgado. Described by Mexican authorities as the leader of Guerreros Unidos, Casarrubias, arrested in October, claimed that about $200,000 changed hands between the gang and Abarca’s office on a regular basis, managed by Pineda Villa, the mayor’s wife. While the government seized on this as evidence of the pair’s criminal ties, other allegations that didn’t fit the narrative were left out. In his statements, Casarrubias painted a picture of a complex local landscape in which Guerreros Unidos and their partners in government — not just the mayor and his wife, but also the municipal police — fought together to retain control of Iguala against the gang’s rivals, Los Rojos. Casarrubias claimed that two state officials had accepted hefty bribes to allow Los Rojos to enter Iguala mixed in with the students on September 26. The alleged infiltration sparked the violence that night, he said. According to Casarrubias, members of Guerreros Unidos had killed 17 suspected members of Los Rojos over the course of the evening. The words of an alleged gang leader should be treated with skepticism, of course. Still, it’s unclear how the PGR determined that certain claims — those implicating the ex-mayor and his wife — warranted publicity, while others that suggested a broader level of corruption and complicity were kept quiet. Casarrubias was not the only alleged Guerreros Unidos detainee to describe scenarios that did not fit into the government’s narrative. Several gang members, for example, said a central role was played by a mysterious Guerreros Unidos figure known only as Chucky (or Chuky or Choky). Depending on the statement, Chucky ordered the attack on the students because they had been infiltrated by Los Rojos; personally snatched three students and threw them in his Mustang; joined police in fatal attacks against non-students on the highway; facilitated a handoff of captured students; failed to facilitate a handoff of captured students; ordered students killed at a location other than Cocula; personally killed students at a location other than Cocula; buried students at a location other than Cocula; and possibly kept students alive well after the government’s timeline would have them dead. According to the detained gang members, Chucky stands between 4 foot 7 inches and 4 foot 10 inches, and is in his mid-20s or mid-30s. He figured prominently in the declarations of two Guerreros Unidos members who described in detail how they killed and disposed of students from Ayotzinapa on his orders. Their claims led state investigators to Pueblo Viejo, a community where 28 bodies were pulled from a series of graves. It seemed like a major break in the case, until state officials were forced to announce that none of the bodies belonged to the students. Chucky largely disappeared in the PGR’s public statements, and only received passing mention in the “historical truth” offered up in January. Chucky, the alleged Los Rojos infiltration, and the 28 bodies are some of the case’s enduring enigmas. Another is this: Why would gang members confess to killing the students at a spot, Pueblo Viejo, where there was no evidence the students were killed — and on the orders of a man, “Chucky,” whose real name nobody seemed to know? The arrest of the “Imperial Couple” is similarly puzzling. In a February report, Proceso uncovered two federal police documents related to the detention of Abarca and his wife. One document said they were arrested in Mexico City, seized from a taxi. The second, dated the day after the video of their arrest was circulated, indicated the pair had been taken into custody near a division of the attorney general’s office. Neither of these documents suggested the couple was arrested at the house where the video purported they were arrested. Pineda Villa, the woman described in the press as “The First Lady of Murder,” was held in preventive detention for 60 days as federal prosecutors attempted to bring formal charges linking her to the students’ disappearance. After allegations of organized crime were twice denied by the court due to lack of evidence, according to Proceso, the government managed to make an unrelated money laundering charge stick. But on April 24, her arrest order was lifted; the court determined that the evidence for the charge was insufficient, and Pineda Villa had been prevented from presenting a defense. On April 30, charges against Pineda Villa for organized crime were reinstated, and she remains in custody. Abarca, accused in the kidnapping of the students, is being held in a maximum security prison. Students were confronted by police at the intersection of Periférico and Juan N. Álvarez Street. IGUALA, THE BIRTHPLACE of the Mexican flag and constitution, has been called Mexico’s “cradle of independence.” Following the students’ disappearance, an alternative title was spray-painted at the bus station where the violence began. “Cuna del narcogobierno,” it read — cradle of narco-government. As municipal police were rounded up last fall, evidence of the narco-government became plain to see. At 6 a.m. on the morning of September 27, 142 members of Iguala’s police force were called in for questioning by state investigators and forced to turn over their weapons. Firearms belonging to 22 department employees returned positive results for tests indicating recent detonation, according to the state’s report, and 48 Iguala officers would eventually be among the 104 people arrested in connection with the case. In nearby Cocula, 16 police officers would be swept up in the arrests. The statements of Cocula officers were among the federal files reviewed by The Intercept. The low-level cops said they worked shifts of 48 to 72 hours for monthly salaries of less than $400, just half of what some of their Guerreros Unidos counterparts claimed to make in a single kidnapping. Their statements — which portray a night of confusion, threats, and cover-ups — provide a vivid portrait of the collaboration between organized crime and local security forces that had taken hold well before the students disappeared. Sixty-four municipal police officers have been taken into custody for their alleged involvement in the attack against the students. On September 26, three patrol vehicles of Cocula police in tactical gear raced to Iguala to support municipal officers there as they loaded up students and took them away. According to several Cocula officers, Subdirector César Nava González gave the orders throughout the night and into the next morning. The officers claimed to have seen students transferred to the police headquarters in Iguala, then transferred in both Iguala and Cocula patrol vehicles to Loma de Coyote, where they were handed off to members of the Guerreros Unidos gang. In the early hours of September 27, the officers returned to their headquarters in Cocula. “The atmosphere was thick,” one police officer said in a statement. “We were shocked.” Nobody was speaking. According to officer statements, Nava then called on half a dozen men to change into civilian clothes, arm themselves with handguns, and head out again in unmarked vehicles. Some officers recognized their destination once they arrived: the ranch of Gildardo López Astudillo, the local Guerreros Unidos chief known as El Cabo Gil, who is still at large. They remained there until the sun came up. While the PGR publicly acknowledged the attempted cover-up in Cocula, the intertwined history between the municipal police and the army in the region has gone unmentioned in the government’s official story. Maj. Salvador Bravo Bárcenas, the director of Cocula’s public security and a former soldier with the 27th Battalion, described in his statement to investigators how he had lost control of the department to Nava. It began in June 2013, he said, when a stranger with a “happy face” walked into his office looking for work. Nava, a former military officer, according to La Jornada, was offered a job, along with four of his companions. Bravo claimed that when he objected, Nava sent another text that warned, “I have located your family.” It was followed by photos of Bravo’s home and children. Bravo said he complained about Nava to the commander of the 27th Infantry Battalion during the summer of 2013. The commander, whose name Bravo told investigators he could not recall, assured him the problem would be handled. Eight days later, Bravo said, soldiers arrived in Cocula and left with Nava and his men. However, they returned that same same day, still in the company of the soldiers, “without telling me a word” of what transpired, Bravo said. Nava remained on the job, and was arrested in the Ayotzinapa case along with members of his crew, according to Proceso’s Gloria Leticia Díaz. Nava’s testimony was not among the materials reviewed by The Intercept. Currently imprisoned, his story remains sealed in the federal government’s investigation. Members of a local teachers union march through Chilpancingo in support of the students, Nov. 14, 2014. BY THE MID-1970s, at the peak of Mexico’s Dirty War, security forces had made hundreds of people disappear — suspected rebels and ordinary civilians alike. Three decades later, a new conflict emerged, tearing at the fabric of Mexican society, with citizens disappearing on an unprecedented scale. On December 11, 2006, former Mexican President Felipe Calderón ordered thousands of soldiers into the streets of Michoacán, Guerrero’s neighbor to the northwest, in a declaration of open war against the nation’s entrenched drug-trafficking organizations. More than 100,000 people have been killed in the years since. Fueled by more than $2 billion in U.S. equipment and training, Mexican security forces at every level have been accused of widespread human rights violations. Far from reducing violence, the campaign has splintered established cartels into smaller groups like Guerreros Unidos, and they have competed to control fractured territory. The tally of known dead is only a partial count of the casualties. There are tens of thousands of others who have disappeared since the conflict began. More than 22,000 Mexican citizens are currently listed as missing, according to the government’s own tally, though the actual numbers are believed to be far higher. An estimated 70,000 Central American migrants have vanished while crossing the country since 2006. Like the 43 students from Ayotzinapa, many of Mexico’s disappeared were last seen being loaded into police or military vehicles. In a 2013 report, Human Rights Watch warned that Mexico was in the throes of “the most severe crisis of enforced disappearance in Latin America in decades.” The crime of enforced disappearance is prohibited under international law and according to the Rome Statute, which Mexico is party to, can constitute a crime against humanity when conducted in a widespread or systematic manner. In its report, published more than a year before the students were taken, Human Rights Watch exhaustively detailed how enforced disappearance has manifested itself in Mexico. 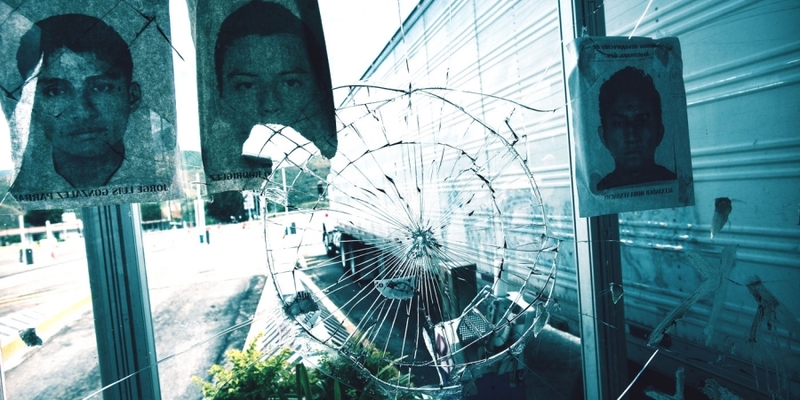 The patterns laid out mirror realities in the Ayotzinapa case at virtually every turn. The report noted, for example, that when individuals are seized by police or military personnel, family members who seek information about their whereabouts are often told the detentions never took place — in Iguala, this was the message conveyed by local officials to search parties the morning after the students were taken. In these cases, culpability for any disappearance typically falls on municipal police more than than other security forces. In the Ayotzinapa case, the only security forces placed under arrest have been members of the Iguala and Cocula municipal police departments. And as Human Rights Watch explained of cases involving state agents and organized crime, “most commonly, security forces arbitrarily detain victims and then hand them over to criminal groups.” In the Ayotzinapa case, Guerreros Unidos seemed to fill this role. Families, rather than the state, are forced to shoulder the burden of finding out what happened. In Mexico, investigations of enforced disappearances are characterized by systemic shortcomings, such as tampering with evidence and failing to promptly secure the crime scene, Human Rights Watch noted. That’s what happened in Iguala, where municipal officers pocketed spent shells from the scene of the first attack, according to John Gibler of California Sunday Magazine, and the crime scene was left unsecured for hours. The handling of the garbage pit outside Cocula where the students’ bodies were allegedly incinerated raised similar concerns. When The Intercept visited the pit on November 11, just four days after the government declared it the probable site of a gruesome massacre, it was unguarded and easily accessible. Among the most painful symptoms of enforced disappearance, as described by Human Rights Watch, is government officials attempting to convince family members that their loved ones are dead without any substantive proof; this scenario unfolded in nationally televised press conferences on the Ayotzinapa case. Families, rather than the state, are forced to shoulder the burden of finding out what happened. “Many relatives give up everything — leaving behind established careers, uprooting entire families, and abandoning long-standing relationships — to focus entirely on their search for the disappeared,” the report said. While the crime of kidnapping can carry a lengthier prison sentence in Mexico than enforced disappearance, the consequences for the state are minimal, because the crime is attributed to just the accused. By rarely bringing enforced disappearance charges, the Mexican government escapes accountability. If cases of enforced disappearance were routinely pursued, they could provide evidence of systemic abuses, which could trigger charges of crimes against humanity and possibly jeopardize the multibillion-dollar security aid package the Mexican government receives from the U.S government, among other consequences. Under the Leahy Law, named after Sen. Patrick Leahy, aid to foreign security forces implicated in gross human rights violations is illegal. To date, just six people have been convicted on federal charges of enforced disappearance in Mexico. Whether the students taken in Iguala were victims of enforced disappearance — and whether the federal government has made legitimate efforts to bring such charges — has become a central question. Under Mexico’s federal transparency law, documents otherwise subject to protection must be released if they relate to an investigation of grave human rights abuses, such as enforced disappearance. Under a state transparency law, Guerrero released a public report detailing its investigation last fall, citing evidence of human rights violations in the case. In February, the Federal Institute for Access to Information, or IFAI, a transparency commission, ordered the PGR to do the same. The PGR initially fought the order, asserting the right to keep its files sealed for up to 12 years, arguing that the case was an ongoing organized crime investigation. By classifying what happened to the students as an isolated incident of kidnapping and organized crime, the federal government seemed to construct a scenario in which its obligations to the parents were terminated, its international reputation and security assistance were preserved, and its investigative files were kept secret. Recently, however, the PGR has appeared to shift its position on releasing a public account of its investigation. After enduring months of criticism, Murillo Karam announced in February that he was stepping down as attorney general. The Intercept has confirmed through multiple sources — including a written response to freedom of information requests submitted by Mexican journalists — that the PGR is now in the process of complying with the federal transparency commission’s order to release a public file of its investigations, though a timeline for the release has not been set. Last week, anonymous PGR officials told the newspaper La Jornada that federal prosecutors had in fact introduced enforced disappearance charges against Abarca and others, but they were denied by the court. According to La Jornada’s sources, the PGR has appealed the judge’s ruling, but no suspects have been formally charged with the crime of enforced disappearance of the students. Neither the judge’s decision nor the PGR’s appeal, however, are public, and attorneys for the families of the disappeared say they have not been able to review them. Despite repeated requests, the PGR would not provide The Intercept with documents or on-the-record comment explaining the status of enforced disappearance charges in the case. Mexican human rights lawyers told The Intercept the PGR has a long history, dating back to the Calderón administration, of failing to substantiate enforced disappearance charges once they are introduced in court, resulting in judges frequently adopting kidnapping charges instead. For the parents of Ayotzinapa’s disappeared, hope for justice rests, in part, with a team of experts from the Inter-American Commission on Human Rights, which is conducting an independent evaluation of the case. Last month, the group released an update on its efforts, reporting that it had reviewed about a third of the nearly 80,000 files on the case provided by the PGR, interviewed suspects currently in government custody, and met with student survivors of the attacks, who guided the experts through various locations in Iguala where the violence took place. The group announced that it would interview soldiers from the 27th Infantry Battalion. As part of their investigation, the independent experts have made several recommendations to the federal government, including suggesting new lines of investigation. Family members in Guerrero meet and register the cases of disappeared loved ones. THE BASEMENT OF the church is filled. The curtains are drawn. A small crowd of reporters lines the perimeter. It’s early November in Iguala. Local organizations have put out a call: The loved ones of people disappeared in the area are invited to meet and share their stories. The plan is to build a registry for DNA testing with the hopes of identifying some of the bodies unearthed in the search for the missing students. It’s a risky proposition. In a place where criminals have governed for years, to put your name on a piece of paper saying this cop, or this solider, or this gangster took my son — it could be a death warrant. Nevertheless, more than 80 people show up, most from Iguala and Cocula. They fill rows of plastic chairs and stand one by one to offer up their stories. A woman in jeans and a gray T-shirt takes the microphone. A little girl in a pink dress fidgets next to her. The woman describes watching helplessly as authorities took her brother and his three friends away, more than a year ago now. She breaks down. “Are these the authorities we have?” the woman asks. One after another the testimonies continue, many through tears, describing husbands gone, sons vanished, sisters disappeared. One mother recounts the ransom calls she received when her son was taken, and the horror she experienced the day his captors put someone else on the phone. The father of two young men disappeared in 2008 speaks up. He describes doing everything in his power to find his boys, but says that when he approached the authorities, he was mocked. Taken in 2006. Taken in 2008. Taken in 2010. Taken in 2013. Taken last year. The stories go on and on. The facilitators ask the reporters to step outside and only those who plan to fill out a missing-persons form to stay put. The reporters exit. Nearly everyone who stays behind picks up pens. May 4 2015, 12:00 p.m. The violence started with shots fired at several buses filled with students. It ended with six people dead and dozens of students seized by armed men. They are still missing. HE NIGHTMARE BEGAN just after sundown. At a dimly lit intersection in Iguala, police with automatic weapons surrounded three buses loaded with college students. The police opened fire. Screaming that they were unarmed, the students fled down darkened alleys, pounding on doors, desperate for shelter. Gunmen put the city on lockdown, stalking the streets in a drizzling rain. By the time the gunfire finally stopped, two dozen people were wounded and six were dead at three locations, the youngest only 15 years old. One student was shot in the head, leaving him brain-dead. A bullet ripped through the mouth of another. Two young men bled to death in the streets, left for hours without medical help. First light brought fresh horrors when the mutilated body of one of the students was discovered in the dirt. Worse was yet to come. During the chaos, 43 students had been taken captive. 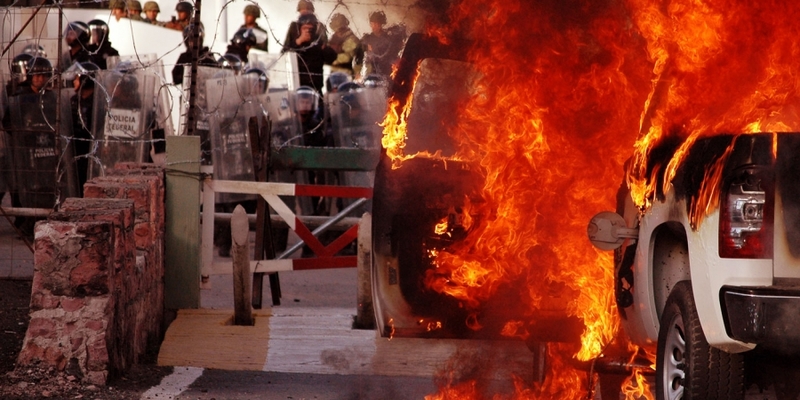 The crimes that began in Iguala on September 26, 2014, had reverberations throughout Mexico. Massive protests have roiled the country. Government buildings have been torched. Mexican President Enrique Peña Nieto was forced to launch what his administration called the largest investigation in recent memory. The site where the bodies of the disappeared students were allegedly burned. More than seven months later, the country is haunted by questions. What really happened that night? Where were the students taken and what was their fate? Though the government has provided its explanation, serious doubts surround the official version of events. While scores of clandestine graves have been unearthed in the southern state of Guerrero since then, the remains of just one student — nothing more than a small chip of bone — have been identified. Having quickly pinned the crimes on municipal officials and their gangster accomplices, Mexican authorities have been accused of attempting to prematurely close the case. Parents of the victims have pointed to what they regard as evidence of broader government complicity in the terror of that night. Human rights groups, investigative journalists, and ordinary citizens have rallied around them. The following account is based on more than two dozen interviews with survivors of the attacks and family members of the disappeared, as well as Mexican historians, human rights activists, journalists, and the statements of government officials. In addition, The Intercept has reviewed state and federal records, including communications reports by Mexican security forces and sealed statements from municipal police officers and gang members. The evidence reveals inconsistencies, obfuscations, and omissions in the government’s account. In the wake of the attacks, the number 43 has become a potent symbol of organized crime and government collapsed into one, of poverty and political repression sustained by decades of impunity, and of tens of thousands of similar cases of kidnapping and murder left unsolved. Popular outrage has been distilled into a simple phrase scrawled on protest signs, spray-painted in the hallways of power, and shouted by protesters in the streets. Ernesto, a first-year student, was on one of the buses commandeered by the students. ERNESTO IS A FIRST-YEAR student at the Escuela Normal Rural Raúl Isidro Burgos, a teacher-training college better known as Ayotzinapa. The all-male campus sits atop the rolling green hills of the southern Sierra Madres in the state of Guerrero. The majority of the school’s students are from indigenous backgrounds, and many speak both Spanish and Nahuatl, a language with Aztec roots. Ayotzinapa, which means “Land of the Turtles” in Nahuatl, is part of a network of normal schools established in 1926 to serve the sons and daughters of Mexico’s most impoverished communities, providing free and secular education to young people who go on to teach in remote farming regions. With a curriculum that fuses agricultural skills and radical politics, students of these schools — known as normalistas — have made for natural leaders in social justice struggles. For the better part of the last century, the schools’ history has been punctuated with violent, sometimes fatal, confrontations with the state. Ernesto (the name he uses with the media) enrolled at Ayotzinapa last July. At 23, he’s well-built with broad shoulders. His close-cropped hair gives him away as a first-year — all new students at Ayotzinapa have their heads shaved when they enroll. On a late afternoon in early November, he took a seat at a picnic table on the school’s basketball court. The sun, sinking behind the mountains as he started to explain what happened, was gone by the time he finished. Students take over the tollbooths at Palo Blanco on the main highway connecting Mexico City with the port and vacation city of Acapulco. Taking commercial buses — some call it commandeering, others call it hijacking — is integral to activism, education, and fundraising at Ayotzinapa. In the absence of substantive financial support from the government, Ayotzinapa has never had enough money for an adequate fleet of vehicles to transport students to remote locations to observe schoolteachers at work and to attend protests. So the students make deals with local bus drivers and companies, taking charge of large passenger buses for days or weeks, often feeding drivers on their campus. The students insist the drivers are not exploited or abused, although some drivers and bus companies have disputed this. In mid-September, normalistas gathered to discuss the logistics of an upcoming action. Each year on October 2, activists converge on Mexico City to commemorate one of the darkest days in the nation’s history: the 1968 massacre of students and civilians by government security forces in a section of the capital known as Tlatelolco. At the September meeting, according to Nexos magazine, Ayotzinapa was selected to take the lead in acquiring transportation. On September 26, nearly 100 Ayotzinapa students, including Ernesto, were dispatched in two buses to collect more vehicles. Nearly all of them were enthusiastic first-years, and most had no idea where they were going. Their first stop was on a highway about 70 miles from campus and 20 miles outside Iguala, the third-largest city in Guerrero. The normalistas split into two teams. One bus waited on the side of the highway, across from a restaurant called La Palma, while the other was sent to a tollbooth closer to Iguala, where the students quickly managed to stop a bus. They bargained with the driver, who agreed to work with them on the condition that he first drop off his passengers in Iguala. To ensure he made good on his word, a group of normalistas boarded his bus. They headed into a city where the line between the state and organized crime had all but disappeared. The intersection in Iguala where two students were killed; crosses mark the spot. AT THE BUS STATION in Iguala, the small group of students watched as their driver stepped off the vehicle. He spoke to a security guard. He made calls. The minutes ticked away. The students started to get nervous. They tried to open the bus door, but it was locked. They frantically phoned their friends. Responding to the distress calls, Ernesto and his classmates on the side of the highway and at the tollbooth got onto their buses and headed for Iguala. Though they may not have known it, their movements were being tracked by state and federal police. In fact, the students had been on the authorities’ radar since early evening, according to records contained in the state of Guerrero’s investigation. A communications record, signed by a state police coordinator, shows that at 5:59 p.m. a call came in indicating that two busloads of Ayotzinapa students had set off in the direction of Iguala. Around 9 p.m. the first wave of student reinforcements arrived at the Iguala station. Young men with shaved heads piled out of the two arriving buses, their faces covered with bandanas and T-shirts. A window was broken and the students in the locked bus were freed. Amid the commotion, the normalistas managed to grab several more buses. Two left on a direct route toward the highway. Three others drove toward the city center and got bogged down in traffic. Ernesto was on one of the buses crawling through Iguala. He estimated that more than 40 other students were on board. The seats were full and some were standing in the aisle. They had passed the central plaza when they saw police lights and heard sirens. They aren’t coming for us, Ernesto thought. Suddenly, a municipal police truck cut them off. The students leaped out to move it from their path. Police officers fired warning shots. The students threw rocks, smashing the window of the police truck. Pedestrians ran for cover. The students navigated their buses around the blockade. Their caravan moved on, followed by police who kept firing. The streets were packed, bringing the three buses to a crawl on a two-lane road. The highway wasn’t far, Ernesto recalled, but the number of police behind the buses was growing — as many as 10 patrol vehicles were now tailing them. Officers weren’t shooting in the air anymore—they were shooting at the buses. Ernesto decided he had to defend himself and his classmates, so he and a number of others jumped off the bus to hurl more stones at the cops. “Close the door and don’t open it for anyone!” Ernesto yelled to the driver. At the head of the caravan, another police truck zoomed in and cut them off; its driver got out and took off running. The normalistas moved into action. Later, in an interview with the newspaper La Jornada, a student recalled the words of his classmate Aldo Gutiérrez Solano. “If they come, we stone them,” the 19-year-old Gutiérrez said. Gutiérrez joined the others attempting to move the abandoned police truck out of the way. Shoulder to shoulder, Gutiérrez and Ernesto pushed against it in the falling rain. Automatic gunfire broke out again. A bullet punched into the side of Gutiérrez’s skull. He crumpled to the ground. “They hit one!” Ernesto screamed. Panicked students dove for cover as Gutiérrez’s blood pooled on the wet concrete. Some crawled under the buses; others ran. Ernesto and another student attempted to pull Gutiérrez to safety, but the gunfire was too intense. Gutiérrez remained in the street, bleeding and unconscious. Tires blew out and glass shattered. One student described bullets kicking off the pavement like firecrackers. Cellphone video recorded that night shows the students yelling at their attackers. Left in the street, Gutiérrez was eventually taken to a hospital, where he was pronounced brain-dead. He remains in a coma. Police began removing students who were on the last bus in the caravan. Bullets had shattered the windows. Blood soaked the seats and spread across the aisle. The students were forced to lie down on the pavement, their hands on their heads. They were then loaded onto the beds of patrol trucks, hoods placed over their heads. Up at the front of the blocked caravan, police were barking orders at Ernesto and his classmates. “Get out of here, motherfuckers!” an officer shouted, even though their only means of transportation were riddled with bullet holes. BLOCKS AWAY FROM the screams and gunfire, thousands of people had been gathered at a public plaza for a celebration hosted by Iguala’s mayor and his wife. Dubbed the “Imperial Couple,” José Luis Abarca and María de los Ángeles Pineda Villa were characterized in the Mexican media as having a paper-thin proximity to murder and mayhem. They would become, in the government’s account of what unfolded, key orchestrators of the crimes that began on September 26. Abarca had started off as a humble vendor selling sandals for a living. Iguala residents say his 2012 election took intimidation, terror, and impunity to new levels. In 2010, federal authorities had investigated Abarca and his wife for illegal enrichment, but no charges were filed. Less than a year into Abarca’s term, a well-known campesino activist was executed and his driver accused the mayor of pulling the trigger. The investigation stalled, and Abarca coasted along unscathed. Former mayor José Luis Abarca (R) and his wife, María de los Ángeles Pineda Villa, attend an event in Chilpancingo in March 2014. Pineda Villa had been an ever-present figure at the mayor’s side, and many people believed the event in the plaza — organized to celebrate her role advancing the city’s welfare program — was the unofficial kickoff of an election campaign to succeed her husband in office. “Lady Iguala,” as she came to be known, hailed from a family of powerful narcos. Two of her brothers were high-level operators within the Sinaloa and Beltran Leyva cartels, at one point overseeing a team of some 200 assassins in and around Iguala, according to the newsmagazine Proceso. In recent years, Iguala had become emblematic of broader trends across Mexico’s most lawless areas. The region known as Tierra Caliente, the Hot Land — which includes the states of Guerrero and Michoacán — is a place where economic despair has collided with the militarism of Mexico’s drug war. In 2006, then-President Felipe Calderón ordered Mexican troops into the streets of Michoacán to fight drug traffickers, unleashing a wave of violence. Amid widespread allegations of human rights abuses, popular support for government security forces began to plummet, and civilians took the fight against the region’s criminal groups into their own hands, forming armed community groups to protect their homes. Guerrero turned into an ever-shifting battleground where smaller groups fought for control of the lucrative heroin trade. Guerrero is Mexico’s largest producer of opium paste, growing an estimated 60 percent of the nation’s poppies, making it a crucial supplier of heroin to the U.S. In 2009, the figurehead of the Beltran Leyva cartel, Arturo Beltran Leyva, was killed in a gun battle with Mexican security forces, and that same month, the two Pineda Villa brothers were assassinated. The Beltran Leyva cartel unraveled and the established order was upended. Now considered by many to be Mexico’s most violent state, Guerrero turned into an ever-shifting battleground where smaller groups fought for control of the lucrative heroin trade. In October, Mexico’s attorney general described Pineda Villa as a “principal operator” of criminal activity linked to one such smaller group — Guerreros Unidos. The gang — which also raised revenue through murder, kidnapping, and extortion — had staked its claim to power in 2012 by leaving 10 severed heads outside a slaughterhouse. In the years that followed, the government claimed, hundreds of thousands of dollars changed hands between Abarca’s office and Guerreros Unidos on a regular basis — roughly $45,000 of which was directed to Iguala’s municipal police, who were under the command of Abarca’s cousin Felipe Flores Velázquez. Abarca’s alleged criminal links were hardly unique, however. In November, the newspaper Milenio reported that 11 other mayors across Guerrero were under federal scrutiny for suspected ties to organized crime. A federal police officer rides atop a vehicle in the town of Cocula, near Iguala, Nov. 2, 2014. Once the students arrived in Iguala, communications among security forces and emergency personnel began lighting up. The first report of shots fired came in from a civilian at 9:40 p.m., according to the state communications record. Thirteen minutes later another call was registered; a young person had been wounded by gunfire. Two more calls followed in quick succession, one requesting an ambulance. The calls were logged in a communications system called Control, Command, Communication, and Computation — or C4 — which collects real-time intelligence available to security forces. The C4 centers are common across Mexico and range in sophistication, with some of the more high-tech outposts concentrated along the border between the U.S. and Mexico, subsidized by U.S. counternarcotics programs. According to Proceso, Iguala’s C4 reports that evening were simultaneously conveyed to federal police units and the military. News of the gunfire quickly reached municipal police in the small town of Cocula, about 13 miles southwest of Iguala. The Cocula officers’ response was detailed in more than a dozen statements included in a portion of the federal case file reviewed by The Intercept. Around 10 p.m., a mid-level officer said he received a call from his boss. The message was urgent, he said: Come toward Iguala, there’s a shooting and we’re going to provide support. I need three units. Around a dozen men were assembled. They dressed in tactical equipment, kneepads, and elbow pads, according to one officer, and armed themselves with assault rifles and handguns. They raced to Iguala in three patrol vehicles. One officer recalled the scene in vivid detail. The windshield of one of the buses had been shattered. Students inside it were yelling, “Don’t shoot! We have no weapons.” From the right side of the bus, the officer saw an arm protruding from a window waving a white cloth. The bullet-riddled bus that carried the soccer players. AN HOUR AFTER the first shots were fired, the violence began spilling over onto the highway outside the city. Armed men were stalking the road as the remaining two buses tried to flee. One bus was caught under a highway overpass. According to the state of Guerrero’s investigation, the discovery of the vehicle was reported just after midnight. The tires were blown out and it was littered with broken glass. A short distance away, there was a pile of clothing — a sweater, a bandana, and eight shirts, one stained with blood. Army records later released revealed that the bus had been stopped by two patrols of municipal police vehicles. At approximately 10:30 p.m., three more police patrols arrived carrying officers described in the records as hooded and dressed in black. Five minutes after the hooded police arrived, the records described them “trying” to remove the students from the bus. The students have not been seen since. The innocent people they killed were not the innocent people they set out to kill. The final bus fleeing Iguala, carrying 14 students, was stopped by police on its way out of the city. Jonathan, a 20-year-old first-year who asked that his last name be withheld, was among those on board. He told The Intercept that as he stepped off the vehicle with his classmates, an officer yelled and pointed his pistol and flashlight at them. They began to walk away from the scene and broke into a run as soon as they were out of the officer’s sight. The group eventually found shelter with a resident of the area who took them in until the next morning. At 12:45 a.m., the C4 communications system catalogued the aftermath of yet another attack on the highway — armed men had intercepted a bus carrying a semi-professional soccer team. Survivors told investigators the driver of the bus lost control during the assault, and the door was pinned closed by a cascade of earth. The passengers dove to the floor, screaming that they were soccer players. They said their attackers replied they “did not care” and let loose with more bullets. At least 60 shell casings were recovered from the scene, including high-powered assault rifle rounds. After the shooting stopped, the passengers heard the sound of two vehicles taking off into the night. Fifteen-year-old David Josué García Evangelista, one of the soccer players, was dead. The driver, Víctor Manuel Lugo Ortiz, was gravely wounded and died hours later. Blanca Montiel Sánchez, riding in a taxi nearby, was also killed. Hospital records included in the state’s investigation list at least eight other players and trainers admitted for injuries that night. Some press accounts have attributed the attack on the highway to Iguala’s municipal police; others reported that members of Guerreros Unidos opened fire, too. One witness, who arrived after the assault, told state investigators the shooters were dressed in dark clothes with balaclavas pulled over their faces. Whoever the shooters were, it seems the innocent people they killed were not the innocent people they set out to kill. The street in Iguala where the students were attacked. BACK AT THE SCENE of the first attack, midnight was approaching. The municipal police had disappeared with the hooded students in the back of their patrol trucks. Ernesto and his classmates who had not been taken away made calls for help to human rights workers, journalists, and their friends at Ayotzinapa. A handful of reporters arrived, and with the students cordoned off the area to preserve evidence, using rocks to mark the bullet casings left behind. The danger had not yet passed. As Ernesto showed reporters the damage done to the buses, Francisco Garcias, a slight first-year student, noticed a patrol truck passing by. “Now, you will see!” a man shouted from the truck. Automatic gunfire soon erupted; the students and journalists dropped to the ground and dove behind cars. During the barrage, two Ayotzinapa students, Daniel Solís Gallardo and Julio César Ramírez Nava, were hit. The young men bled to death in the street. Soldiers from the 27th Battalion, stationed less than 2 miles away, reported discovering their bodies at 2:40 a.m., nearly three hours after the shots that killed them were fired. Omar García, one of the students who took cover when the shots rang out, sprinted away during a lull in the gunfire. With him was Edgar Andrés Vargas, a young man whose mouth had been lacerated by a bullet. García told The Intercept that he and two dozen other students ran to a private medical clinic to seek treatment for the wounded, including Andrés Vargas, whom they carried. They pounded on the door, pleading to be let in. Once inside, the frightened women working there refused to help. The students begged for an ambulance. Instead of paramedics, patrols from the 27th Battalion showed up. With weapons raised, the soldiers forced the students to the ground, ordered them to remove their shirts, and rifled through their pockets. No medical care was given to Andrés Vargas. He couldn’t speak because of his mouth injury, so he used his phone to communicate with his friends, according to Sin Embargo, a news website. “GET ME OUT OF HERE BECAUSE I AM DYING,” he wrote. The soldiers issued a threat before leaving the clinic. “If you give us false names, you’ll never be found,” they warned. A banner with portraits of the 43 missing students. WHEN THE SUN ROSE the next morning, the extent of the carnage began to emerge. In the span of no more than five hours, according to the state’s file, at least five buses, six cars, and one motorcycle were wrecked, shot up, or both; and 195 shell casings were discharged in Iguala and on the highway, nearly half of them high-caliber rounds. Twenty-five people were admitted to the hospital that night. Six people had been killed. Around 7 in the morning, a photograph began to surface online. It showed a young man splayed out on his back on a patch of dirt, amid scraps of garbage. To his right were rivulets of blood, turned deep maroon in the morning sun. He was wearing gray and white sneakers, and his blue jeans had fallen low around his hips. His red T-shirt was pulled up to his sternum, revealing heavy bruising around his torso. He had no ears and no eyes. The skin of his face had been removed from his skull. The tortured corpse had the buzzcut of a first-year student. Ernesto saw the mutilated body at the medical examiner’s office, where he and a handful of classmates had gone to identify victims collected from the streets. “The medical examiner told me that he was alive when they did that,” Ernesto said. The young man’s name was Julio César Mondragón. Overnight, as word of the attacks spread, worried mothers and fathers had raced to Ayotzinapa. Those who couldn’t find a ride walked to the campus. They waited out the night with prayers and candles. In the morning many of them went to Iguala to join the surviving students searching for their friends in the city’s jail cells and hospital beds. Before returning to Ayotzinapa, the students gave state authorities a three-page, handwritten list of their missing classmates. A crowd of anxious parents and family members met them at the campus. People cried and hugged. Mothers and fathers asked Ernesto about their sons. “They’re coming,” he said about the ones he knew were safe. For the others, he struggled to answer. The list had the names of 64 students whose whereabouts were unknown. The following day, as more came out of hiding, the number was reduced to 57. It wasn’t until September 30, four days after the attacks, that the true number emerged: 43 students were missing. Top photo: Tollbooth with flyers of the missing students. Keith Dannemiller for The Intercept.